The word balance has a number of meanings but the one this article is concerned with is along these lines, from the Oxford Dictionary. So I gave her a shove and she fell over. So, what do we mean by balance? Did I really do the old lady a favour? Probably not but wouldn’t it have been better for her if she’d practised Tai Chi to the extent that she couldn’t be pushed over so easily? Now for the technical stuff. Balance is mediated by the vestibular nuclei in the brain stem. The brainstem is the region of the brain that connects the cerebrum with the spinal cord. Motor and sensory neurons travel through the brainstem allowing for the relay of signals between the brain and the spinal cord. The brainstem coordinates motor control signals sent from the brain to the body. The Inner Ear. Here we find the labyrinth with its three semicircular canals which sense rotary motion. The brain senses the speed and direction of this rotation of the head by the movement of the fluid in the semicircular canals. The Eyes. Everyone knows that trying to stand on one leg with closed eyes is a whole different ball game compared to when the eyes are open. The Musculoskeletal System. Sensors in muscles, tendons and joint capsules all feed information to the brain. This is called proprioception, which is the sense of the relative position of neighbouring parts of the body and strength of effort being employed in movement. Balance is maintained by the interaction between the labyrinth and these other systems. When something interferes with the efficient working of any of these systems then we are said to be ‘off balance’ and likely to feel dizzy or fall over. Even healthy older adults usually have less secure balance than they had when they were younger. Older adults may be taking many medications or are coping with chronic conditions that can interfere with balance. Often several conditions can come together to produce balance problems. 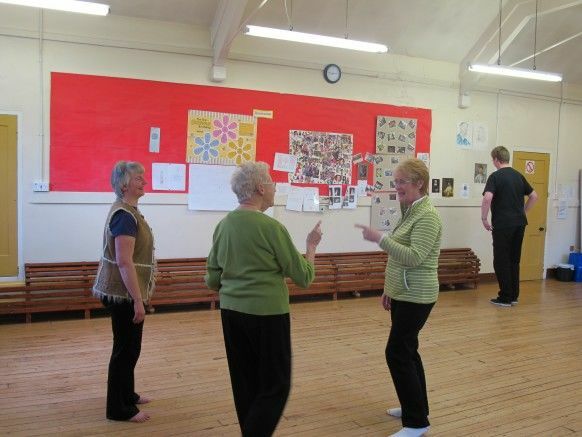 In the Tai Chi classes that I attend there are usually some people who have a problem with their balance and need to hold on to something when doing certain of the warm-up exercises which involve standing on one leg. Why should standing on one leg be more difficult? The obvious reason is that the bigger the base the more stable the structure. Think of how stable a pyramid is, but imagine what would happen if it was turned upside down. The pyramid, however, doesn’t have proprioception and we do. There is less information about how you are reacting with the ground when only one leg is in contact with it. You also have to shift your centre of gravity to a less familiar place; it’s like taking a leg off a three-legged stool and then finding the position where it can stay balanced. This brings me to the question of whether if you have lost some of your balance skill, can you do anything to restore it? I can use my personal story to illustrate this point. (Yes, more about me again!). At some point in time in 2004 or early 2005 something unexplained and undiagnosed happened to be leading to my becoming aware that my previous excellent balance had significantly deteriorated. When I re-started Tai Chi in late 2014, after a 28-year gap, one of the first things I noticed was my poor balance in both those warm-ups and in the form. I fully expected, and hoped, for this to improve as I re-learned more and more of the form. After about six months I found that this wasn’t happening. Perhaps it was never going to recover. It then dawned on me that I wasn’t giving it a chance. I realised that I wasn’t placing my feet lightly when stepping through the postures in the form, I was just plonking them down, in other words not testing my balance just working within my limitations. The phrase ‘If you want to make it better- use it’ springs clearly to mind. I started changing the way I moved my feet by trying to step in a way that would allow me to bring my moving foot, should I wish to, back from the place where it was due to hit the floor to its previous position, without touching the floor. In this way, I cut out the unbalanced plonking and my step became much lighter. Eureka! I began to notice that my balance was gradually improving. I could, for example, manage to perform the warm-up exercise where we stand on one leg with far fewer needs to put my other foot down. Another boost came when Steve showed me his set of balance in improving exercises. If you don’t know these, ask him to show you and impress him by showing that you do read his newsletter. I can’t say that my balance skills are what they were 40 years ago but they are certainly much better than two years ago. And I hope for further improvements yet! If you are one of the many who struggles with your balance please don’t give up on it. You do, however, have to test it a bit to make it improve. Right from the very first foot movement start thinking more about how your feet hit the floor during the form. Are you landing heavily, breaking a fall, as I used to? As I did until I got my light-bulb moment.